Foreigners banned from buying land in South Africa? Where are the dog friendly beaches in Cape Town? The Reserve Bank decided at their last meeting to keep interest rates at the same level. With the increase in petrol price and hike in taxes, inflation and interest rates might be rising soon again. It has become very fashionable for authorities to fine financial institutions and the South African Reserve Bank (SARB) is following the trend: The Johannesburg branch of Deutsche Bank has been fined R 10 Mio. for inadequate controls against money laundering and terrorism financing. The fine did not mean the bank had facilitated these acts, but SARB inspectors had found weaknesses in the bank’s adherence to legislation to deal with such crimes. Problems were found with the identification and verification of customer details and the detection of assets of those possibly associated with terrorism. Income tax rates for individuals earning more than R 181’900 p.a. will be increased by 1%. However, tax brackets, rebates and medical schemes have been aligned with inflation. The net effect is that only those earning more than R 450’000 p.a. will pay higher income tax. There is an increase from R 257 to R 270 for the first two dependants, thereafter R 181 (was R 172) for each additional beneficiary. As from 1 April 2015, the fuel levy will increase by 30.5 cents and the road accident levy by 50 cents per litre. This equates to an overall fuel levy of R 2.55 per litre for petrol and R 2.40 for diesel. This means that from 1 April filling up will cost you 80,5 cents more per litre and in addition to the recent “normal” increase of 96 cents, petrol will cost R 1,76 more per litre! The yearly boring increases were announced this year again: A bottle of spirits increases by R 3, 77, a bottle of wine by 15 cents, a can of beer by 7 cents and cigarettes by 82 cents per packet. With 11% in the top transfer bracket, South Africa has one of the highest transfer duties in the world, which is effectively a tax on wealthy people. An investor in one of these products will not pay tax on the income earned in the product – whether it is interest, capital gains or dividends; and there is no tax when a withdrawal takes place. South Africans will be able to save up to R 30’000 per year (with a lifetime limit of R 500’000) and not pay tax on the return they have earned. Most financial institutions are launching their products these weeks. The widely publicized changes to taxation of contributions to retirement funds was due to take effect as from 01 March 2015 but had been postponed during the past year to 1 March 2016 (i.e. the 2017 tax year). One of the bombshells in this budget was the announcement that retirement annuities are no longer exempt from estate duty as it is now proposed that a maximum age be re-introduced at which withdrawals may be taken. In 2008 the upper age limit of 70 for membership of a RA was removed but the government has now made a complete u-turn on this matter. Qualifying businesses with a turnover below R 335’000 a year will pay no tax, and the maximum rate for small businesses (businesses with a turnover below R 1 Mio per year) is reduced from 6% to 3%. To complement this relief, SARS is also establishing business desks in its revenue offices to assist small businesses with complying with their tax obligations. The proposed changes to the small business tax regime could be a first step to bringing a greater percentage of the informal sector into the tax net. Foreign investment allowance: South African resident’s allowances will increase from R 4 Mio. to R 10 Mio. per calendar year. Discretionary allowance: The sub-categories under the annual R 1 Mio. allowance will be removed and South African residents will be able to send up to R 1 Mio. per calendar year out of the country for any legal purpose abroad. Emigration: The allowances increased from R 8 Mio to R 20 Mio. The para-statal is in need of a capital injection of R 23 Bio. which will be funded by the sale of Government’s non-core assets. The Minister refused to comment which assets will be sold, but it is speculated that it could be shares in Telkom and/or Vodacom. A centralised system will be introduced in April on the advertisement of all government tenders which will be managed by the Office of the Chief Procurement Officer. A central database will have suppliers registered countrywide which will reduce the administrative burden. It is said that corruption has cost the government R 1 Bio. State employees are no longer allowed to do business with the State with the implementation of the Public Administration Management Bill, signed off by President Zuma in December last year. The fund is sitting with a surplus of R 90 Bio. and there will be relief for employers and employees during the 2016 tax year: The Minister proposed that the UIF threshold should be reduced to R 1000 per year. This means that for a one year period, the employee will contribute a maximum of R 10 and employer will contribute a maximum of R 10 per month. Fortunately, the income tax increases were bearable and there were no increases in the VAT rate or an introduction of an additional wealth tax. Most of us were probably expecting higher increases and more indirect taxes. Many people think that Minister Nene has struck the right balance in trying to control government spending, reduce corruption and increase the tax base for those that can afford it. Consumers will hardly be able to make use of the tax-free investment scheme after the tax and petrol price hikes. South Africa needs to create capital required for growth. Nothing has been said to cut our high unemployment rate. The tax increases will hardly have any effect on government’s revenue because they have been offset with lowered thresholds etc. Government debt and debt repayments, which have climbed to 13% of total government expenditure, have not been addressed. With an economic growth outlook of approx. 2.0 % the rating agencies will be watching over South Africa’s progress and will be quick to reduce ratings if goals are not achieved. The recently published trade deficit of R 24 Bio., the highest ever recorded, will not be of much help in getting a stronger Rand and a better rating outlook. As from 1 March 2015, interest paid to non-residents is subject to SARS 15% withholding tax. The tax will be automatically deducted by the financial institutions and paid over to SARS. The definition of a non-resident is defined by the South African Reserve Bank as a person (i.e. a natural person or legal entity) whose normal place of residence, domicile or registration is outside the Common Monetary Area (CMA), which consists of Lesotho, Namibia, South Africa and Swaziland. If there is a double taxation agreement (DTA) in place with his country of tax domicile, such agreement could reduce the effective tax rate to 0%. Some local financial institutions are giving the clients the option to sign a declaration that they are subject to foreign taxation and no withholding tax will be deducted. All local banks are currently busy with the implementation of the systems and you will be notified shortly. Please note that our money market fund’s income is mainly exempt and will have almost no effect on the withholding tax. The option to sign the form confirming subject to foreign taxation will be available too. Within a 5 year period of becoming a permanent resident in South Africa, your foreign driver’s license needs to be converted into a South African license. This is prescribed by the National Road Traffic Act of 1996 and no insurance companies will accept any foreign driver’s licenses after this period. Should you be involved in a motor accident, your claim unfortunately will be repudiated without a valid license. This grace period has recently been extended from 1 to 5 years which should give sufficient time to do the conversion. We urge all our foreign clients to please take note of this requirement as we will be unable to assist in the event of a claim. SA ID Book – if you do not have one, you first will have to go to the Traffic Department and apply for a “Traffic Register Number”. You will receive a green A4 form. Original foreign driver’s licence, which you no longer have to hand in, an international one is not accepted. The Department will make copies and hand the original back to you. Confirmation letter from the foreign traffic department, confirming that your driver’s license is still valid and which type of vehicles you can drive. Please click here if you would like to read the extract from the National Road Traffic Act. For further information, please contact the Department of Transport on 021-4832078. Dysfunctional alarm systems provide ample opportunity for criminals to strike. Make sure your alarm system is operational and test your batteries on a regular basis. Batteries normally last for 6 hours, some up to 24 hours. Load shedding is no longer an unforeseen or sudden event, which is a condition on any claim to be covered by your insurance policy. If your alarm does not work due to a power outage and you have a burglary, you need to prove to the insurance company that you have taken all reasonable and prudent steps to avoid a burglary. These could be fully charged batteries, extra manual locks on gates, doors and windows etc. Make sure that you know how to operate your gate manually so that your car is not parked outside. Ensure that your cellphones are fully charged before load shedding so that you can make emergency calls. Install solar lights; keep LED lanterns and torches easily accessible. Inform yourself about the load shedding schedules and when you are affected. If you go out, be careful when returning home and maybe ask your security company to accompany you. Don’t open your fridge and freezer too often during power outages. The contents can be preserved for 24 hours if not constantly opened. Insurers normally do not pay for spoiled food. Your electronic equipment and machines can get damaged when electricity is restored and a spike or surge takes place (“power surge or power congestions”). Coverage for such damage is not standard on most polices and needs to be taken out separately. We recommend that you install surge arrestors (or power congestion isolators) on your main power distribution board at home or at work. This will limit damage to computers, TVs, fridges, gate motors and swimming pool pumps. The arrestors can also prevent damage from lightening, they are inexpensive and make sure they are installed by a qualified electrician. If you don’t have the arrestors, unplug all your appliances to protect them when the power comes back on. Generators must comply with the South African National Standard (SANS 10142-1:2003). Use a licensed and qualified electrician to install the unit. The generator must stand on a level surface. The generator cannot be plugged into an outlet to power the house (“back feeding”). It is illegal and presents an electrocution risk! Do not install indoors due to CO-poisoning risks. Do not place any homemade cover over the generator. Fuel for the generator should be stored outside, in properly labelled, non-breakable containers. When refuelling, switch off the unit and let it cool off first. Spilled fuel on a hot engine could ignite and cause a fire. Never use matches or candles near a generator. Use a torch when turning the generator on. Keep a fire extinguisher in close proximity of the generator. Don’t touch the generator with wet hands. Buy a reputable brand and maintain it. The risk of accidents increases with load shedding. Be patient at traffic lights and make sure it is safe before crossing an intersection. In South Africa, the legal limit is a blood alcohol limit of 0.05g per 100ml, a fact that should be burnt into every motorist’s memory, says the Automobile Association of South Africa. According to drinking&you.com, one unit of alcohol, or two thirds of a beer with 5% alcohol, will increase your blood alcohol content (BAC) by between 0.02g and 0.03g per 100ml depending on your body weight. Two beers are equal to 3 units and will most likely increase your BAC above the legal limit. We often encounter problems when recoveries for motor accident damages are processed. 3rd parties often admit liability at the scene of the accident but later submit a claim to their insurance company stating different facts. This normally results in the insurance companies abandoning the process and both policy holders are faced with a possible excess that is lost and an adjusted no-claim bonus. Get independent witnesses to write down a statement that clearly describes the sequence of events. Make sure you have the contact details of the witnesses as well. Draw a sketch of the accident and get the 3rd party to sign it off as well. The 3rd party does not have to admit liability, but the sketch must be clear in identifying the party at fault. Make sure the incident is reported to the nearest police station. Unfortunately, the Traffic Police has got no judicial power and will not be of much assistance at the accident scene. According to a recent study by the prestigious medical journal, “The Lancet”, South Africa hosts the fattest population in sub-Saharan Africa with the highest incidence of type 2 diabetes. The revelation is a devastating forecast of not only the future of the nation’s health, but that of the economy as well. Since 1980, there has been an increase of 27.5% in obese adults. An obese person is defined as one with a body-mass-index (BMI) of 25 or more. There has not been one country worldwide to decrease the number of obese citizens, but South Africa is far above the worldwide average. Many experts blame the food industry for the epidemic, by adding sugar into the food. Of 600’000 items tested in the USA, 80% contained added sugar. The food industry uses 56 other names for sugar on the label, so that the consumer cannot detect it. Between 2006 and 2015, the accumulated losses to South Africa’s GDP due to diabetes, stroke and coronary heart disease is estimated to cost the country USD 1.8 Bio. Professor Tim Noakes, leading advocate in South Africa for the low-carb, high fat diet known as “Banting,” predicts that the diabetes/obesity epidemic will bankrupt medical services – one of them the USA, which will become unsustainable by 2026. If your government does not display a leadership program, our health industry could see the same fate even sooner than the USA. With effect from 1 March 2015, contributions to these policies are no longer tax-deductible, but the proceeds will be tax-free. Clients with such policies need to reassess their cover limits, as the sum insured is no longer the gross monthly income, but 100% of the average net monthly income. Business and diplomatic travellers from South Africa’s BRICS partners – Brazil, Russia, India and China, are to receive a port of entry visa into South Africa. Home Affairs Minister Malusi Gigaba commented “I have approved the issuance of port of entry visa to BRICS business executives for up to 10 years, with each visit not to exceed 30 days. The visas have been in effect since 23 December last year”. It clearly shows that these countries have become more important to the SA government and it might be in connection with SA’s nuclear plans? Major banks will soon be taking applications for new smart card IDs, Home Affairs Minister Malusi Gigaba said in a recent communique. Standard Bank, Nedbank, and First National Bank have so far signed memoranda of understanding with the department, to assist their clients. The Post Office will also be incorporated into the project. The banks will take the biometric photograph, automated fingerprint, and electronic signature. This is then compiled into an electronic package and deposited to Home Affairs. Applicants would collect their IDs at the banks. The pilot project with the three banks is expected to begin in April 2015. At the moment, only applications to 60-year-olds and 16-year-olds can be accepted by the Department. At the moment, of the 403 Home Affairs offices countrywide, only 110 have had a “live capture” system for processing smart card IDs and new passports. By March it is expected that 140 offices will have the new technology. The old green ID books would remain valid. As mentioned in a previous newsletter, new PR holders no longer receive the pink sticker in their passport and have to travel with the PR certificate when crossing the SA border. We recommend that you make a colour copy, have it certified as a true copy (we can do this for you) and have the document laminated. Leave the original PR certificate at home in your safe. Should you lose such, there are no alternative PR certificates and you will receive a letter from the Department, confirming that you had a PR certificate. If you have an ID book, present such as well at the border authorities. 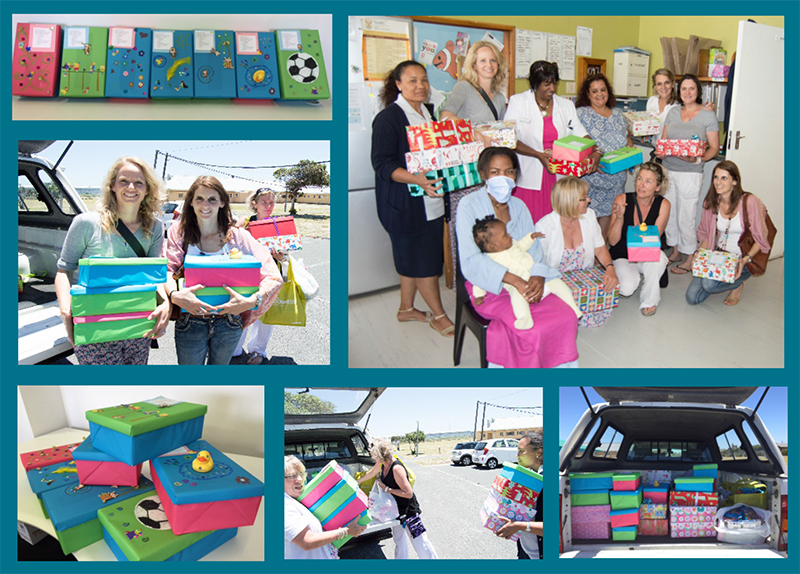 As part of the Nelson Mandela legacy “67 minutes” every staff member created and filled a shoe box for the children infected with TB who are treated at the Brooklyn Chest TB Hospital in Ysterplaat. We dropped off the love filled boxes on the 10th of December 2014. We were pleased to spend some time with a few of the children, currently free of TB and who could shortly leave the hospital. A special moment that we will never forget. We recently attended the Golf Day at Arabella Golf Estate in Kleinmond. MUA Insurance Company sponsored a lucky draw which included a tour to a wine estate in a chauffeur driven 1957 Bentley. Congratulations to Mrs Renate Steytler, who was the lucky winner of this fantastic prize! The ownership by foreigners relates to agricultural land only. No person shall own more than 12000 hectares of land. Foreigners can own agricultural land on a 99 year lease basis. The legislation would not affect foreigners currently holding land. The new Land Holdings Bill, which regulates these issues, still needs to be debated and signed off by Parliament sometime this year. The reasons for the proposal were not put forward and with only approx. 3% of all property owned by foreigners; experts claim that the move is a populist gimmick to gain votes ahead of the 2016 elections. The good news is that foreigners wanting to buy a residential property can still do so. We will keep you updated on any further developments. Beaches where dogs can run freely: Clifton 1st, Sunset Beach at Milnerton, Tableview, the middle section of Hout Bay Beach, Long Beach Kometjie, Long Beach Simonstown, Witsands, Sonwabe, Glencairn, Dolphin Beach and Granger Bay. Beaches where dogs are allowed on a leash: Nine miles, Greenways to Strand swimming pool, Windmill beach, Clovelly and Fisherman’s beach. Beaches where dogs are allowed before 9am and after 6 pm from November to April: Camps Bay, Llandudno and Glen Beach. Beaches where dogs are allowed under certain conditions (find out from Municipality): Fish Hoek, Danger Beach, Muizenberg and Sunrise Beach. Beaches where dogs are not allowed at all: Beat Beach Bakoven, Milton, Big Bay, Blaauwberg, Bikini Beach, Clifton 2-4, Maidens Cove, Silverstroom, Broken Bath, St. James tidal pool, Blue Waters, Gordon’s Bay main beaches, Monwabisi resort and Three Anchor Bay. Please consult the relevant Municipality for further details if you are uncertain about the above. Residents of the Johannesburg suburb have accumulated over R 3.6 Bio. of debt to Eskom. This amount is far more than what the rest of the country owes to Eskom, which currently stands at about R 2.6 Bio. In the dying days of Apartheid, the ANC vaguely promised free electricity to all South Africans. Many residents in Soweto have not paid any bills since the ANC come to power, holding the ruling party to its promise. With Eskom in financial trouble, the Government has urged all South Africans to do their bit, a message widely rejected in Soweto. Those citizens who are disconnected by Eskom from the supply, illegally reconnect themselves again. Eskom is facing multiple challenges and it will be interesting to see how they handle them. We are pleased to announce that Mr. Marius Romer will be joining us from 1 May this year. Mr Romer has been in the insurance industry for many years and has been practising in Switzerland. He will be assisting Mr Hug with the short-term insurance operation and we are looking forward to welcoming him soon in our company. Tiziana Di Cosmo will remain our Claims Manager and Carola Kurz will be assisting us on the administration side. Do you want to know about a specific topic, share something with us or comment? Please feel free to send us an e-mail so that we can assist.